Revlon reveals its latest, covetable lip launch for 2016 with a sultry, seductive take on matte lips. Introducing NEW Revlon Ultra HD Matte Lipcolor™, for velvety matte high definition colour with a lightweight, moisturising feel. Formulated with Revlon’s 100% wax-free gel technology providing vivid colour with every velvety smooth swipe. A plush applicator provides easy, smooth application. Available in eight sultry shades and scented with the irresistible fragrance of whipped vanilla and creamy mango. Availabilty: From leading pharmacies and departmental stores nationwide. Let me start off by saying “ OH MY GOD!” Every time Revlon South Africa launches a new product in South Africa, it gets better and better and BETTER. I think we’ve officially came across the best product Revlon can offer us, introducing Revlon Ultra HD Matte Lipcolor. I love how everything about this lipstick screams CLASSY! The lipstick is packaged in a gorgeous matte tube, with a shimmering soft matte silver lid, with a package like this, the lipstick is definitely going to get some admirers. As soon as you open the tube, the deliciously sweet scent hits you, it is a subtle vanilla scent, a scent so yummy, you can’t help but catch yourself sniffing this liquid lipstick a few times just because it smells so good. The applicator gets a big THUMBS UP from me, it is a paddle applicator, which means you get enough product on both sides of the applicator, so you can coat your lips in two coats of this matte lipstick. Here comes a little bit of the disappointment, the Revlon Ultra HD Matte Lipcolour isn’t 100% matte, yes it leaves lips with a gorgeous velvety colour, but to me it isn’t completely matte, which I don’t have a problem with at all… in fact, I find it much more comfortable to use to work on a daily basis, and the colour last through the long boring meetings and the quick lunches. I have the shade 635 HD Passion, which is an eye catching dark pink colour, the perfect shade for a girls night out, or a quick lunch date, for me… this shade is my everyday to go lipstick, since purchasing it, I’ve worn it everyday to work for two weeks so far, I think I’m a little obsessed. I love how the lipstick sits so comfortably on lips, without creasing, no fading and best part.. no flaking off or tight feeling like your lips are facing a drought. To make sure you get the best look with the Revlon Ultra HD Matte Lipcolour, make sure you exfoliate lips regularly because it makes a HUGE difference, and apply a thin layer of lip balm first and lightly blot your lips, so your lips are moisturised before you apply the lipstick. On my search for the ultimate matte liquid lipstick I came across this brand. The name seemed convincing and the packaging is matte as well so I thought this is definitely it. I did not even test them. I took two, one is red and the other a burgundy color. Much to my disappointment they don’t have a matte effect. They don’t suit my complexion either so I have to use a lip liner along with them. They smell good but if you are looking for matte then I wouldn’t suggest them. I like this lip colour, it’s not very matte so if that’s what you after I would not recommend it. The liquid just never quite dried but it does have a really good lip stain. The colour is there even after a meal. I had really high hopes for this product after I read somewhere it was a good dupe for a Kylie lipkit shade, I can’t remember which one but I bought the dusty rose Revlon matte lip. I found it didn’t apply that well. It became streaky and didn’t dry down like I expected to. To be fair it was the first liquid matte I had bought and I expected it to be an unmovable matte like Kylie’s, so my expectations were high and probably unrealistic. I found the product just sat uncomfortably on top of my lips, never really settling or blending in. I wasn’t crazy about the smell but I do LOVE the colour. The dusty rose colour is perfect on my skintone and still remains one of my favourite colours. I would repurchase this product but I’m not going to stop wearing it. I am always a fan of a good matte lipstick. I fell in love when I saw the range last year and recently saw that Revlon added more lovely colours. 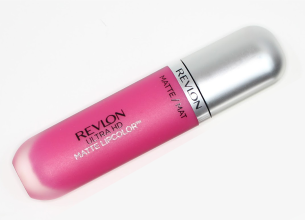 Revlon has 16 shades of this luscious and divine smelling matte lip colour. What I really like about this matte lip colour is that with just one application, your lips are plump and full. It is not as drying as most matte liquid lipsticks. It does not portray a flat matte look, but rather a subtle matte colour. The shades are gorgeous and suit almost every skin tone. One tiny problem that I experienced was that the colour tends to bleed on the lips but that is nothing a good lip liner cannot fix.